Positive feedback is very powerful. It’s important to let others know that their efforts have been noticed. When someone does something well, acknowledging their success sends a message that they are valued and appreciated. Recognition can come in an assortment of ways from a wide variety of sources: from a simple thank you to the formal presentation of an award. Recognition can take place in private or in public and may come from a manager, supervisor, student, customer or co-worker. At Carleton we have a number of formal and informal ways to recognize great work. Service Excellence is enacted every day at Carleton University, but once a year we open up nominations for examples of how Carleton staff and faculty go above-and-beyond and truly inspire Service Excellence in exceptional ways. The Service Excellence Awards are an opportunity for the Carleton community to celebrate all staff and faculty who consistently deliver exceptional service. Each month Service Anniversaries are posted on this website and shared with managers so that milestones are never forgotten! Betty Weiss (1923-1993) was an administrator in the Faculty of Social Sciences at Carleton. During her 20-year career at Carleton, Weiss exemplified service-oriented leadership and was described by professors and deans as “the heart of the faculty.” Weiss had a genuine concern for others, offered support on projects and believed small acts could make a great difference. Her influence was felt across campus as she often challenged processes by breaking through bureaucracy to make things work for people. Friends and family of Betty Weiss endowed this award in 1993 to honour her and recognize employees that carry on in her spirit. The recipient of this award is consistently responsive, innovative, efficient, professional and encourages such behaviour in others. They are role models with exemplary behaviour that makes them wonderful ambassadors for Carleton. The Betty Weiss Memorial Award is presented annually at the Service Excellence Awards Luncheon. Each June faculty and staff come together to enjoy some food and celebrate the accomplishments of the past year. 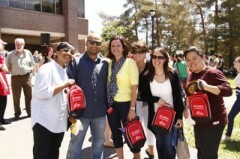 Carleton University Appreciation Day is more than a gathering in the sun with colleagues. It’s an opportunity for managers and directors to say thanks for all that you do for the Carleton community. For a glimpse into the last event, check out the Carleton University Appreciation Day page. Nominations and applications for these awards are accepted by the Office of the Provost and Vice-President (Academic) in the Fall each year and the Office the Associate Vice-President (Teaching and Learning) will be happy to help you develop your nomination package. The Office the Associate Vice-President (Teaching and Learning) recognizes teaching excellence through the internal awards for the Provost’s Fellowship in Teaching, the New Faculty Excellence in Teaching, and the Excellence in Teaching with Technology. For external awards, the Office of Associate Vice-President (Teaching and Learning) will be happy to help you develop a successful nomination package. The Vice-President (Research and International) is proud to celebrate research achievements through Carleton’s annual Research Achievement Award program. The Vice-President (Research and International) will be happy to help you develop a successful nomination package. For more information, please visit the CURO website. For more information about internal awards in your Faculty, please contact your Dean or staff in the Office of the Dean. For more information about internal awards in your department/academic unit, please contact your Chair/Director or Departmental Administrator. Carleton University’s Health & Safety Award is presented annually in September by the Office of Environmental Health & Safety and the Joint Health & Safety Committee in recognition of one person’s demonstrated commitment to fostering positive safety culture at Carleton. More information is available on the Environmental Health & Safety Website.